Along with hearts, groundhogs and dead presidents, February is a month to celebrate embroidery. Here are some pointers to tempt you into picking up needle and thread and making your mark on fabric. Embroidery has existed for centuries as a method of adding decoration to both clothing and household goods with needle and either thread or yarn. Occasionally beads, mirrors, or pieces of metal or bone are also used to vary the texture, reflective quality, or shape of the piece. Traditional patterns of flowers, animals, or symbols existed in different communities, almost as a way of identifying the wearers with their locale. Hi! I'm Dutch -- you can tell by the tulips on the hem of the skirt. In its simplest form, embroidery starts when we draw or trace a simple outline pattern onto fabric, then stitch over these lines with a back stitch, which creates a solid line in thread. The most common current version of this would be popular redwork. Katie Aaberg shares some cute and simple examples of redwork that she will incorporate into a baby quilt. NOT that back stitch embroidery has to be this plain -- though it's always this simple. 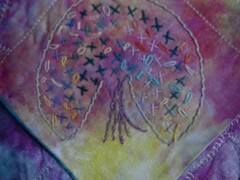 Check out Jenny Hart's awesome collection of alternative embroidery designs at Sublime Stitching. From skulls to takeout food to artists' series -- oh my! I love the modern edge to her patterns paired with such a classic stitch form. Don't you? Stepping up the difficulty scale just a bit, we move from redwork to blackwork. Blackwork again uses simple stitches -- a running stitch, a double running stitch, or, again, a back stitch -- worked evenly over threads. Because of its even-patterned nature, the important thing when doing blackwork is to carefully choose a background fabric with a even weave, such as linen. Britain's Embroiderers Guild has a charming blackwork project using a variety of threads to create foreground, background, movement, and depth. From simple back stitch and running stitch, you can move on to buttonhole stitch, straight stitch, French knots, and the Lazy Daisy. You can consult YouTube for lots of great, simple videos that demonstrate embroidery stitches. Once you get a handle on just a couple of these stitches, you may begin to see the whole world in patterns, repeats, knots, lines, texture. Everything can be rendered into embroidery. My favorite form is an idea from Embroidery Guild's online project resources: Encrusted Calico. (In Britain what we Yanks call muslin, they call calico.) Encasing simple items such as beads, plastic rings, or metal washers between two layers of muslin/calico, then playing with layers of stitches on top provides a rich and wonderfully textured surface. I've used these playful pieces as small purses, pockets and pins. The City Sage created a montage of Etsy makers who embroider. Needles and Words declared that as part of National Embroidery Month, Saturday, 2/20/10 was another Stitch In Public day, though apparently a number of chapters of the Embroidery Guild chose to celebrate this on the first Saturday of the month. Marie Grace thinks a the celebration is great -- it's given her an excuse to embroider for a whole month. Sheri at cafemom shared several of her favorite links to projects. Intrigued and want even more? Check out Sharon B's PinTangle for a great collection of patterns, stitches, and ideas for incorporating stitching into your life. photo credit from debra roby's flickr stream. I also blog at: Weight for Deb and BlogHer on Wednesdays and Saturdays. I am a free-lance writer whose interest has always been drawn to what people when they are not working. But really. The blog tells all. Get the Hands-On Bloggers widget and many other great free widgets at Widgetbox! Get the I Heart Zappos Ventana widget and many other great free widgets at Widgetbox!